Born in Gallup, New Mexico in 1971, Derrick Gordon is a prolific young silversmith who is the father of three daughters (the youngest born earlier in 2003). He learned to smith silver from his uncle Delbert Gordon. He is accomplished in many aspects of the trade and makes fine rings, bracelets, earrings, pins, pendants and more. 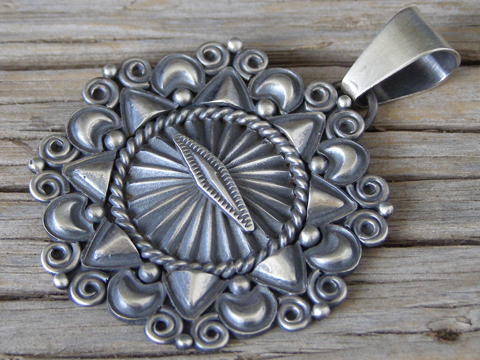 This round pendant is decorated by a combination of appliquées and scrollwork with the cardinal directions and intermediate directions marked by stylized arrowheads and crescent moons alternating with wire scrollwork on the edges. Hallmarked Derrick and stamped Sterling on back.